If you've been watching the news lately, I'm sure you've caught a glimpse of yesterday's Person-of-Mystery, Robert M. La Follette, Sr. Still unsure that you've seen him? 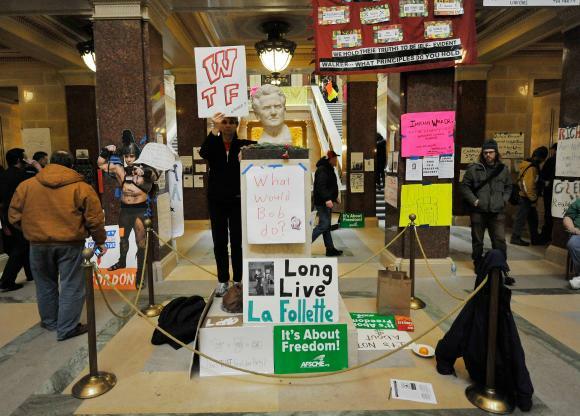 If you've seen any of the recent protests at the Wisconsin State Capitol, you've probably seen a bust of him prominently displayed. Here in our home, we've been watching the Wisconsin protests with interest. 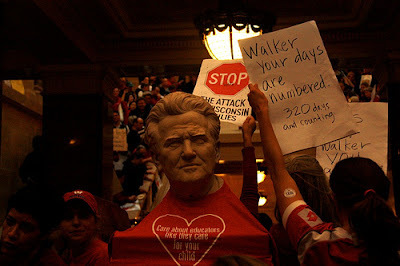 Not because of the politics, but because my wife is from Madison and it's fun for her to see pictures from Wisconsin. 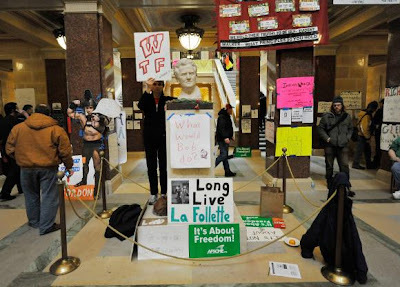 We were well familiar with La Follette as she even attended La Follette High School. Go Lancers! 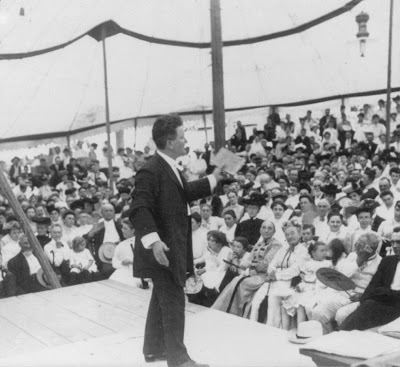 "Fighting Bob" La Follette certainly lived up to his name. 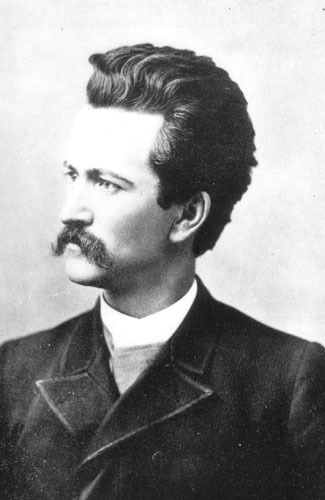 First elected to the US House of Representatives (as a Republican from Wisconsin) in 1884, he served three terms. 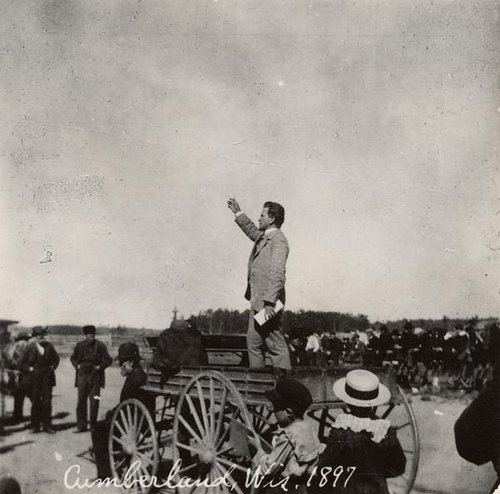 While in the House, he championed causes for Blacks and American Indians. 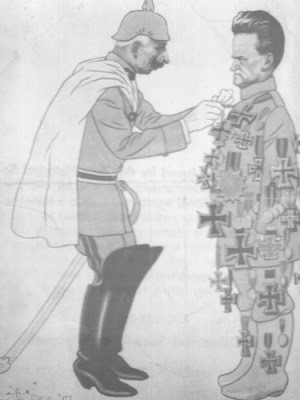 He also fought railroad interests and other big business. La Follette went on to serve Governor of Wisconsin from 1901 to 1906, where he rose to national prominence through the reporting work of muckraking journalists. 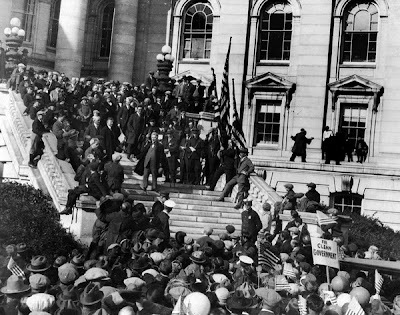 In 1905, while still serving as Governor, he nominated himself to the United States Senate and was confirmed by the Wisconsin State Senate (this was before the direct election of Senators). He continued to serve as Governor for the better part of a year, with a vacant Senate seat in Washington to continue to enact his Wisconsin agenda. Finally in 1906, he took his appointed seat. While in the Senate he was known as a superb orator and is frequently ranked among the most influential Senators of all time. 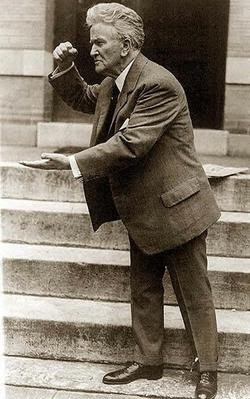 He pushed child labor laws, suffrage for women, and was the foremost opponent of America's entry into World War I. Like all good fighters, he gained plenty of enemies, but like all good fighting Senators, the filibuster was one of his weapons. For those outside the US, a filibuster is a strange rule in the US Senate, where Senators can attempt to prevent a vote or stall legislation. The only rules are that they must continue to speak about something and you cannot leave the Senate floor. On May 29, 1908, La Follette decided to attempt a filibuster of the Aldrich-Vreeland Bill. He began speaking at 12:20 in the afternoon and continued talking for hour upon hour. As evening came around he requested mixtures of milk and raw eggs from the Senate dining room be brought to him to keep up his strength. Between the hours of 10 and 11 pm, he took a sip from another of these mixtures. Suddenly his eyes widened and he started to gag. He set the glass down and he felt sick. Someone had poisoned his drink. His symptoms quickly worsened. He had shooting pain and his stomach churned. His bowels were unsettled and he doubled over in pain, but he refused to leave the floor and he continued speaking until 7:03 am the next day. Later, a chemical analysis showed that someone had put enough ptomaine in his drink to kill most men. 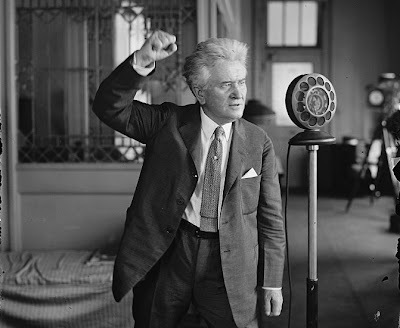 La Follette even ran for President in 1924 under the Progressive Party ticket. He lost, but captured Wisconsin and won 17% of the vote nationally. He continued in the Senate until his death the next year. I may not like all of his politics, but you gotta love a fighter! You could have given me a list of 500 names and the chance to pick 490 of them and I would not have gotten him. And you knew American Horse by sight?!? What an interesting fellow. I appreciate so much that you give us a little history of your Person of Mystery. I had to go to Google to find out anything about American Horse. I think he was Sitting Bull's son. Nate, which part of his politics don't you like? Child labor laws? Rights for blacks and American Indians? Voting rights for women? People forget that disallowing child labor, safe working conditions, the 8-hour day and the 40-hour work week are because of courageous individuals, progressives, and unions who literally fought with the paid goons hired by corporate interests. How many young women died in the Shirtwaist Factory Fire? Ha ha ha, Mary. It does sound bad when I re-read what I wrote. No, I have admiration for much of what La Follette did, particularly for his anti-war and anti-imperialism stances. I'm still pro-women's suffrage and anti-slavery (thanks). Plenty of admiration for a man with convictions. I don't particularly like some of his his proto-welfare state legislation and his later complicity with big labor. Off the top of my head, I think somewhere between 150 to 200 died in the Triangle fire, but I may be wrong. That is not where my mind went. I just thought with his beat up face he must be a boxer. PJM's photo was easy to tell the guy was an Indian.